No, I’ve made another. I’m building options right now, so this guy allows me to field another 5 man Skyclaw squad, or to use the models for a single 10 man, and besides, he was sat in a drawer covered in blue paint and Ultramarine symbols, and who wants that? He wasn’t an easy conversion. This guy is old, and therefore metal. Fincecast would be a much better proposition for anyone daft enough to try and emulate me. 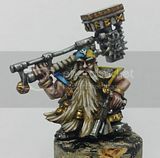 He has the same style of head as the last one and some GS work to emulate the fur of a pelt, there's a belt of Russ stuck on there, and some fetishes, oh and the apothecary gubbins too, cos these guys are that. Although we wont talk about SW having no access to FNP. No. We wont. The green stuff work looks really good! Is he married up with the jump pack chaplain?? Indeed he IS the jump pack chaplain.